Perfect for a crunchy breakfast, a quick snack or sprinkled on top of hearty, winter crumbles. 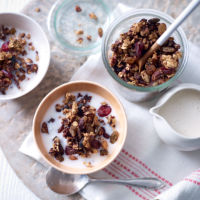 Make batches of this granola to have ready in the cupboard. 1 Preheat the oven to 170ªC, gas mark 3. Line a large baking tray with parchment paper. 2 In a large bowl, mix together the nuts, oats and seeds. In a small jug, mix together 3 tbsp water with the oil and maple syrup. Pour over the oat mixture and stir together well. 3 Tip the mixture into the prepared tray and spread out into an even layer. Bake for 35–45 minutes, stirring from time to time until golden (it will become crunchy as it cools). 4 Stir in the berries and chocolate then leave to cool completely.